Whoa! 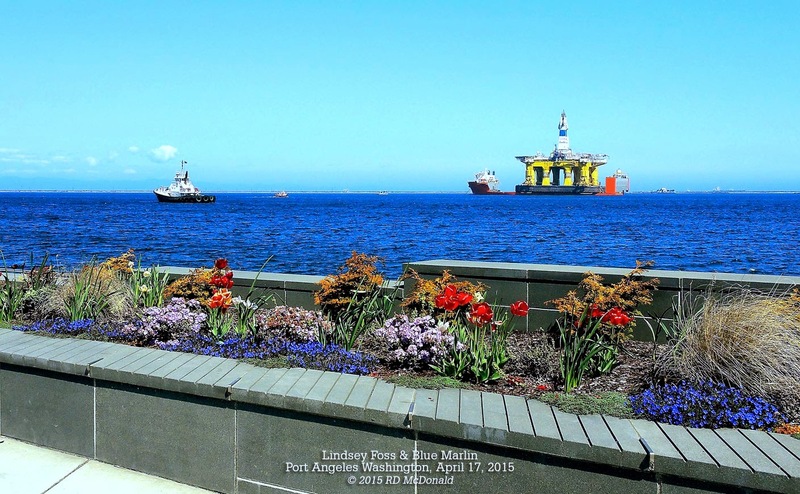 This sight anchored in the harbor, greeted residents of Port Angeles, Washington on Friday morning, April 17th! 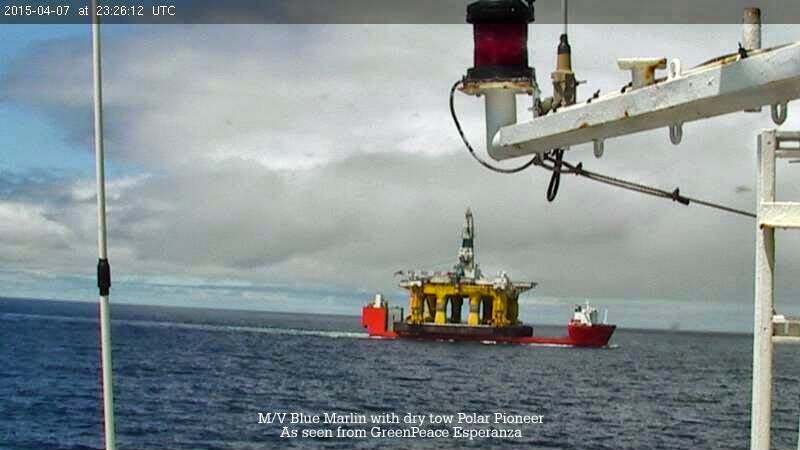 The heavy lift vessel Blue Marlin entered the Strait of Juan de Fuca around midnight Thursday the 16th, dry towing the Modular Offshore Drilling Unit (MODU) Polar Pioneer, shadowed by the Greenpeace Esperanza. 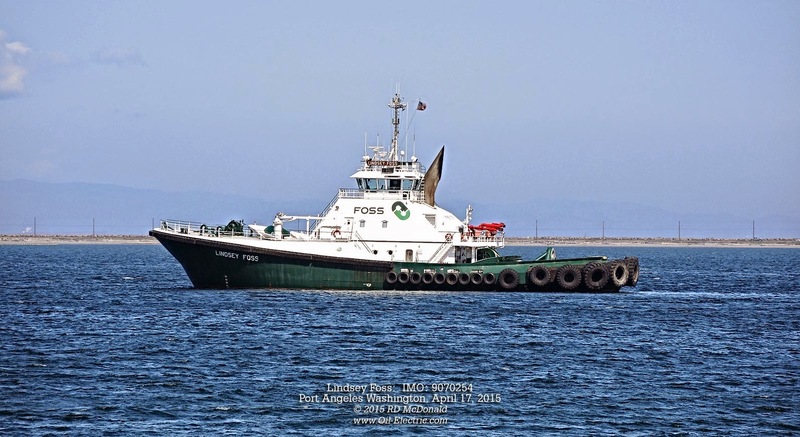 Arriving just off Ediz Hook, the tow was met by a pilot vessel, two Foss tugs, two Coast Guard escorts. 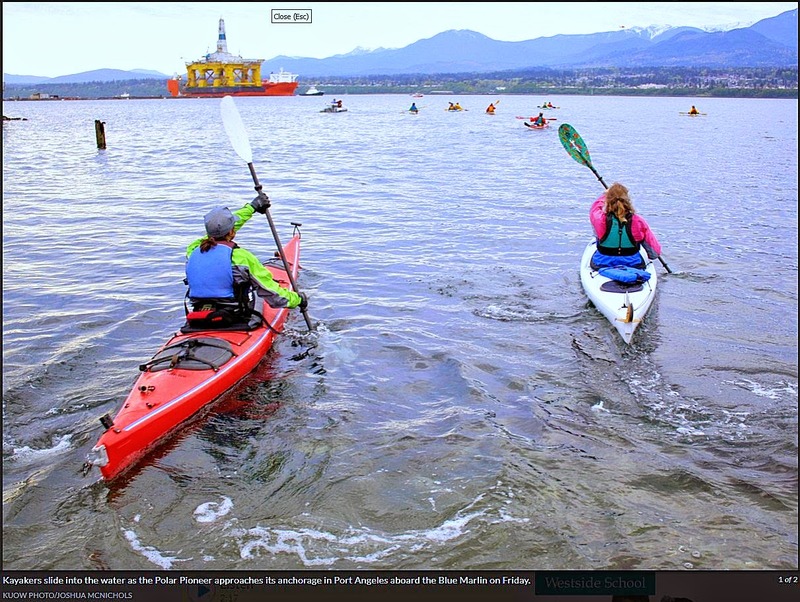 And once inside the Hook, a gaggle of activists, who prefer to be known as "kayaktivests." With the assistance of Foss tractors Lindsey and Andrew, the Blue Marlin was positioned in the anchorage area just after 7:00 a.m. local. Greenpeace Esperanza peeled off from the convoy, and is now alongside in Victoria, just inside the Ogden Point Breakwater. And I drove over to Port Angeles, arriving just after 10:00 a.m. 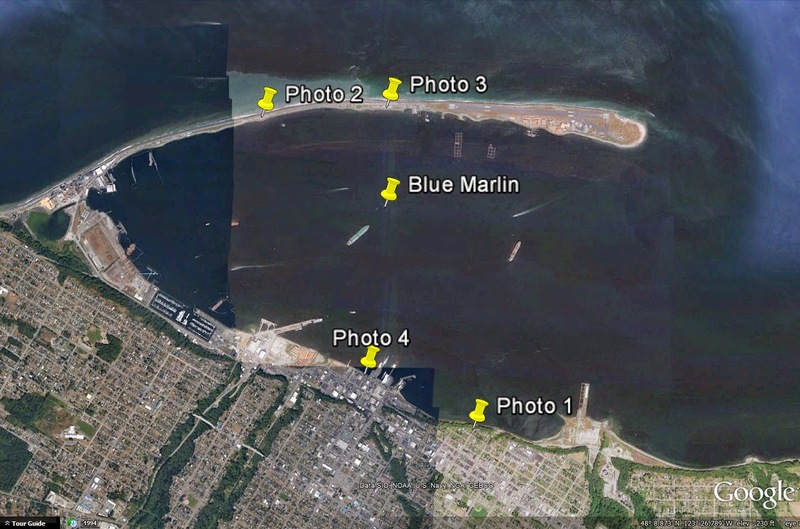 Her location inside Ediz Hook has multiple public locations for shooting that "Money Shot!" 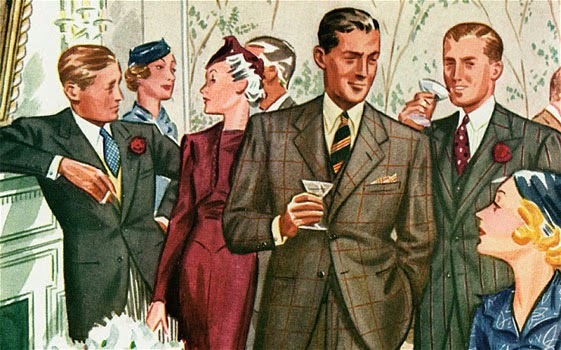 I was gob-smocked! I've never seen such a massive testament to design and engineering. It wasn't until some kayaks approached - under the watchful eye of a Coast Guard vessel - do you begin to grasp the size of this MODU. This is like having the 28 story (354' -108 m) UBS Tower, located in Nashville, planted in the Bight of Ediz Hook! 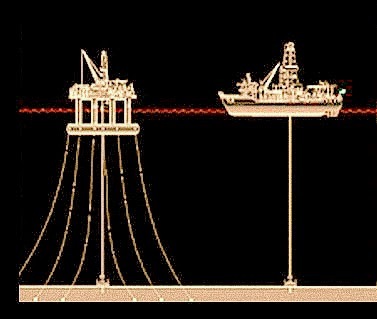 And renders the Polar Pioneer / Blue Marlin combination the tallest structure on the Olympic Peninsula! "This MODU is rated to drill in water depths of up to 1,600 ft. The unit is rated to achieve a maximum total drilling depth of approximately 25,000 ft. and can accommodate about 100 crew members. Station keeping is achieved via a conventional mooring system, read: anchors. 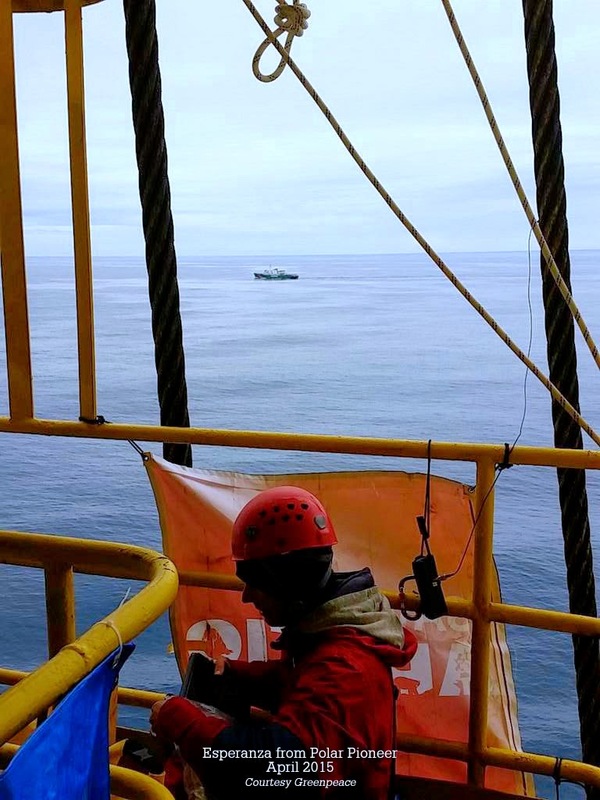 "Transocean Polar Pioneer is one of just a handful of rigs in the world to have an Acknowledgement of Compliance certification (AOC) from the Petroleum Safety Authority Norway (PSA). This tough-to-obtain certification allows the rig to work in the Norwegian sector of the North Sea, a closed market due to harsh conditions and extremely stringent regulations around offshore facility specifications and technical qualifications. Polar Pioneer owned by a company familiar to us, Transocean. 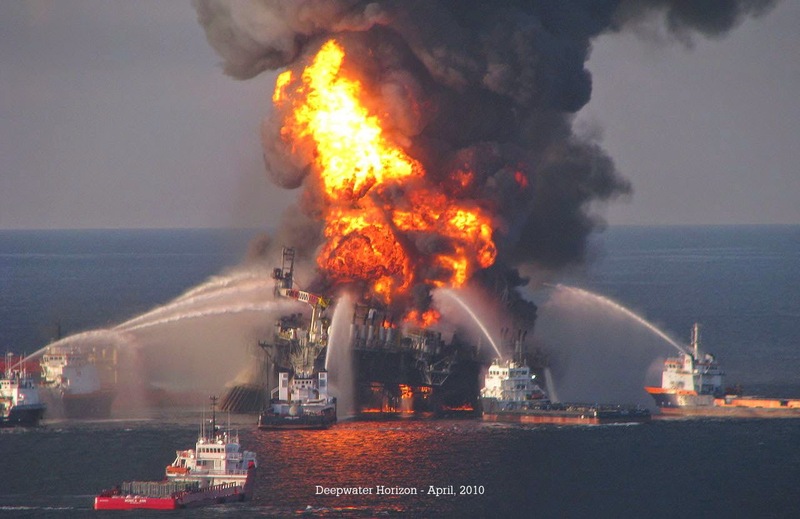 You remember Transocean's Deepwater Horizon, which blew up five years ago today (April 20), in 2010, devastating the Gulf of Mexico. 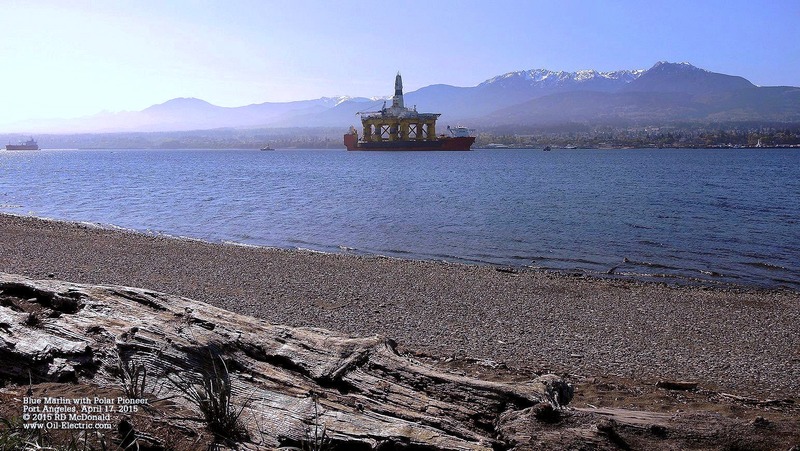 SO WHY IS POLAR PIONEER IN PORT ANGELES? 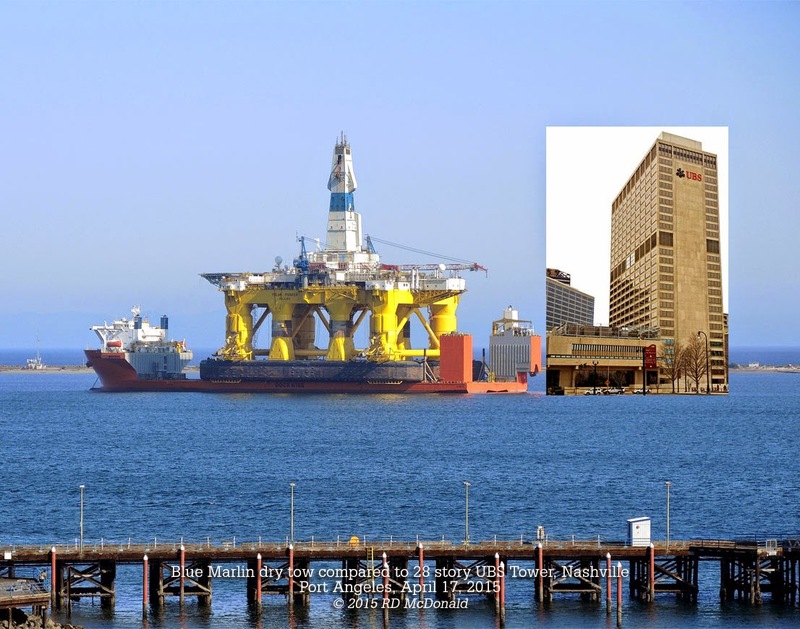 Royal Dutch Shell, following a reckless and humiliating exodus from Alaska in December, 2012, had to pick up the pieces and rethink what it takes to operate in Alaska and the Beaufort and Chukchi Seas in the Arctic. 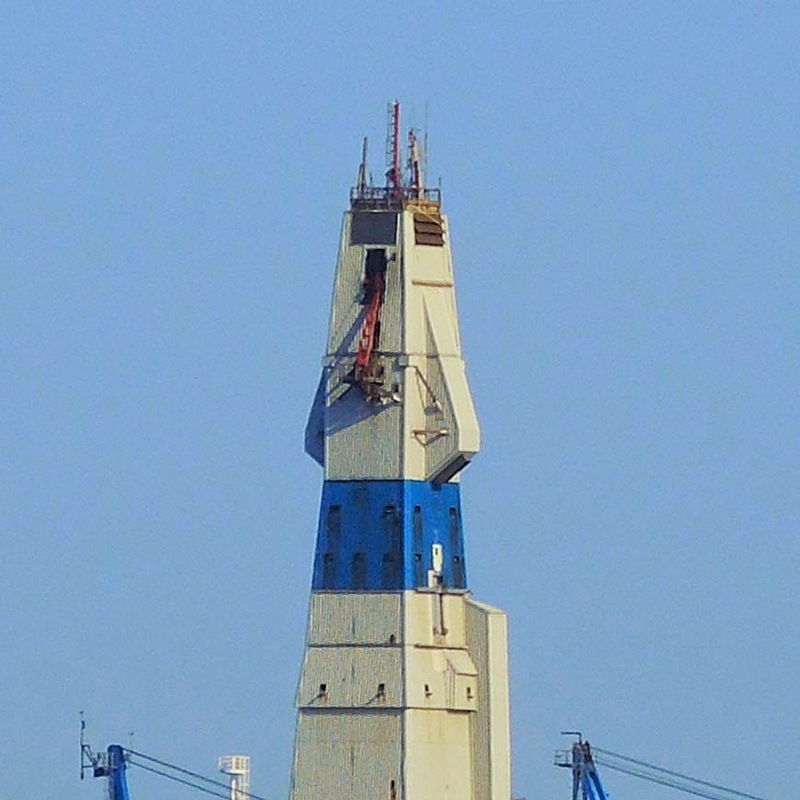 As we reported in "Shell's Shattered Ships," the Conical Drill Rig Kulluk was transported to Singapore following her grounding near Kodiak Alaska, where she languished until 2014, when she was dry towed to Zhoushan, China, for scrapping. 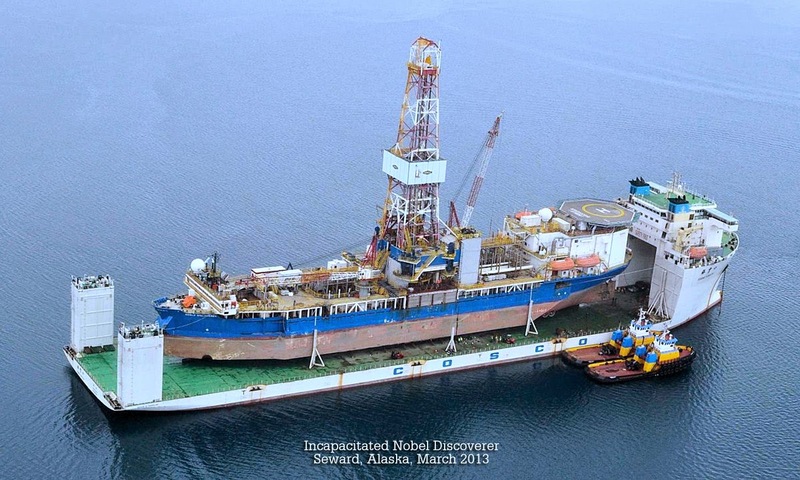 And her backup drill ship Nobel Discoverer was transported from Seward to Korea for repairs, after being declared unseaworthy by the US Coast Guard. 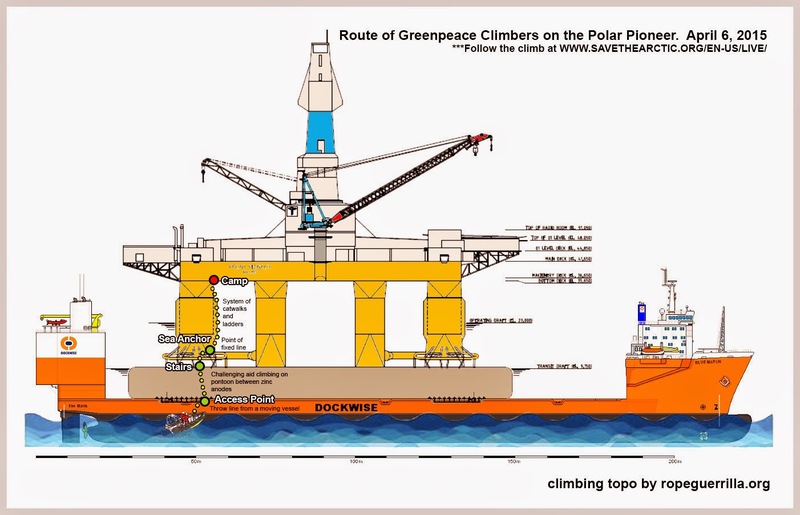 Last year, Shell announced that a revitalized fleet consisting the Nobel Discoverer, backed up by the Kulluks replacement, Transocean Polar Pioneer and tug Aiviq, would lead an expedition back to the Chukchi Sea, picking up where they left off in 2012. 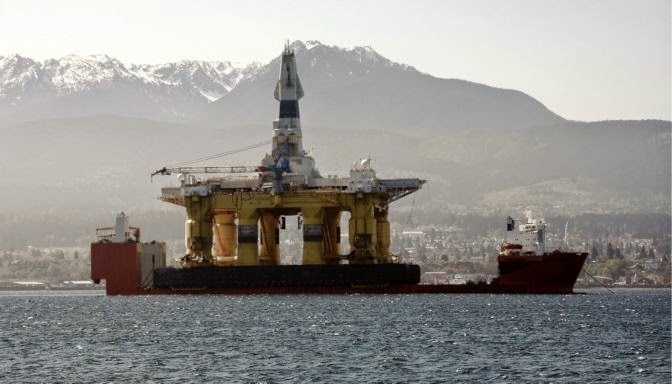 An announcement that did not escape the ears of Greenpeace and dozens of other groups who want to protect the Arctic from any incursion — especially offshore oil development. 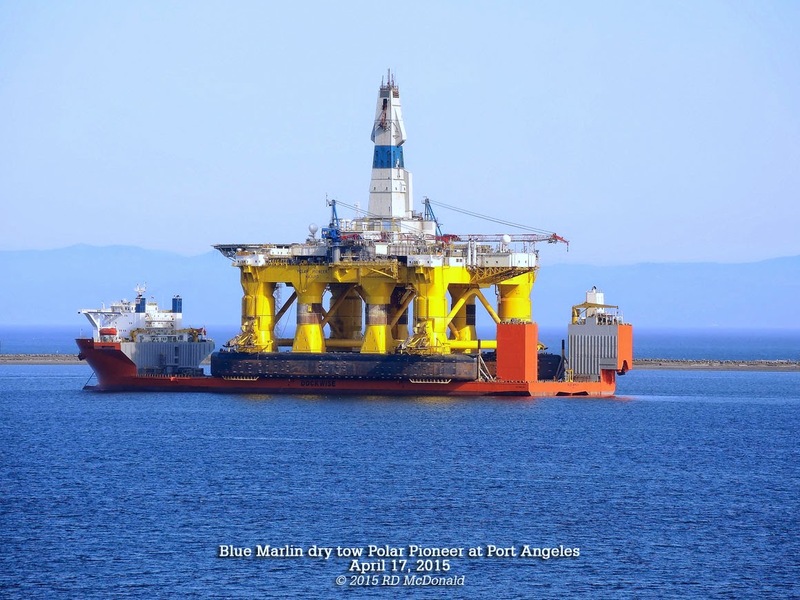 And so it was when earlier this year, Dockwise Blue Marlin was hired by Shell to transport the Transocean Polar Pioneer from Brunei Bay on the northwestern coast of Borneo island, in Brunei and Malaysia, to Seattle for outfitting and thence to the Chukchi Sea. 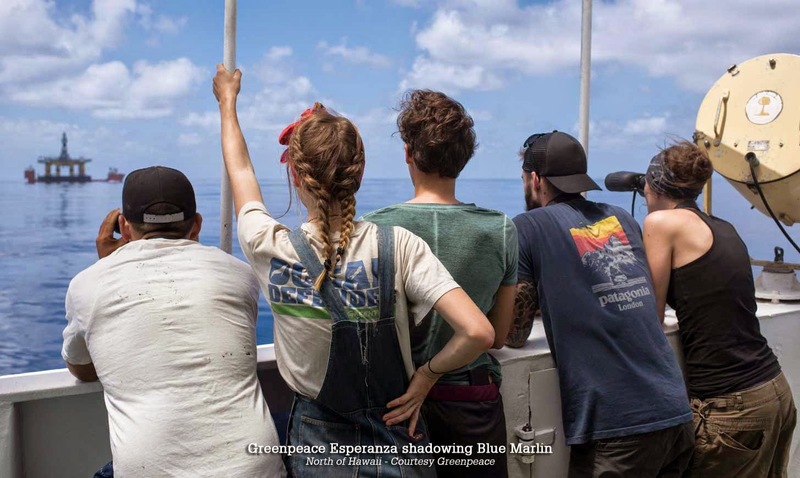 Following an anxious search, the Greenpeace Esperanza, with 35 souls aboard, tracked down the tow, shadowing her across ~5,000 miles of open Pacific. 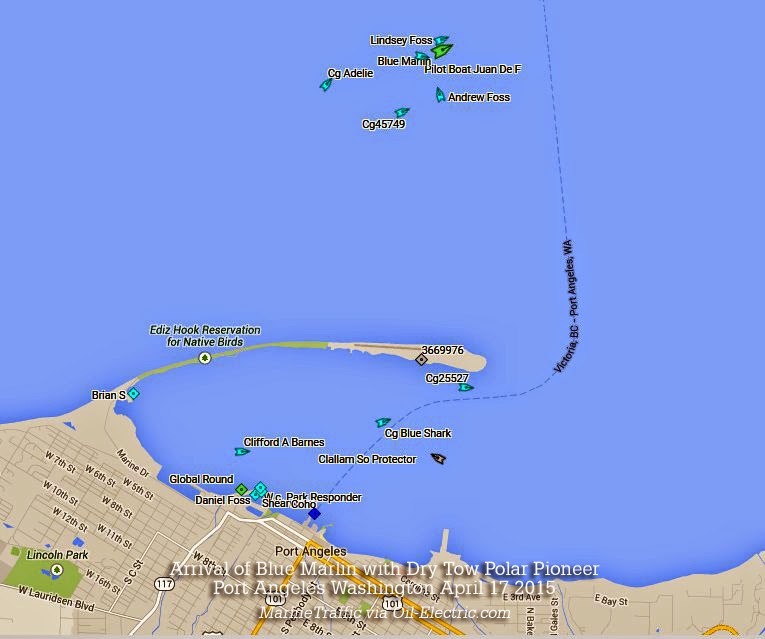 The Polar Pioneer will be off-loaded in Port Angeles, releasing the Blue Marlin. 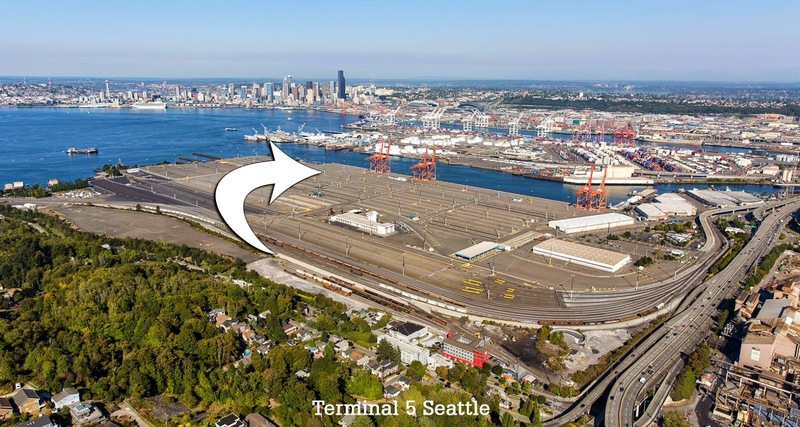 The drill unit will be prepped and inspected to be wet towed to Terminal 5 in Seattle, Shell's new Southern Base. The Nobel Discoverer, under contract with Shell through at least 2016, is or should be departing Singapore, eta Terminal 5 unknown. And the "infamous Aiviq" is already along side at Terminal 5. 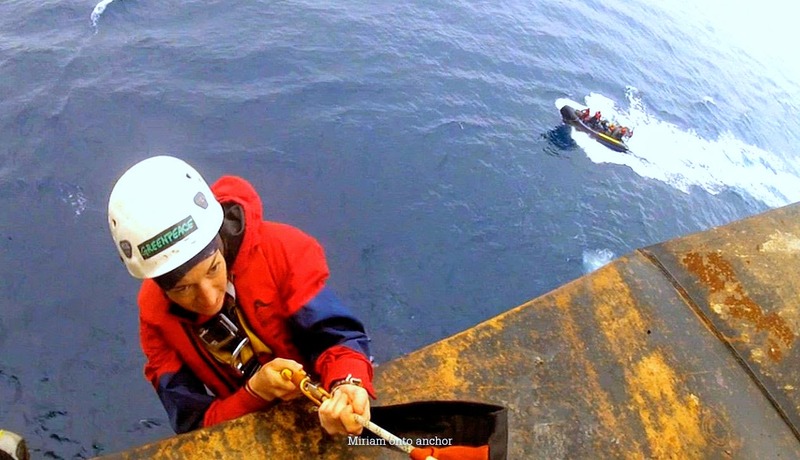 Introducing Miriam Friedrich (left) and Zoe Buckley Lennox, waving from the latest Greenpeace camp-out aboard the Polar Pioneer. 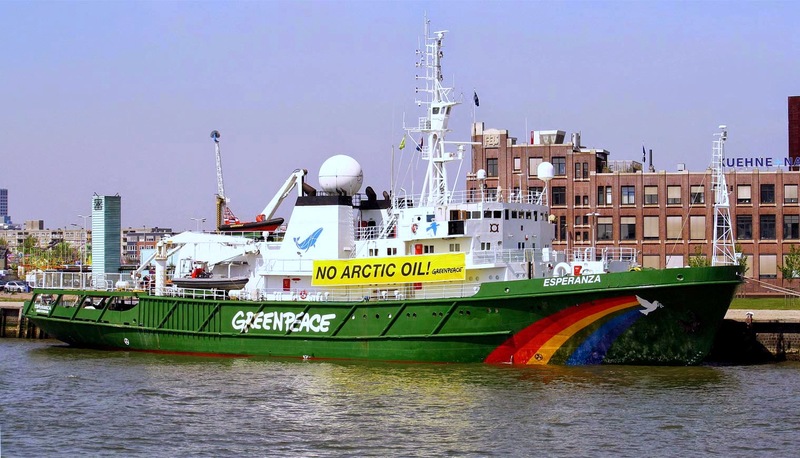 Last Monday (April 6th), Greenpeace made her move. 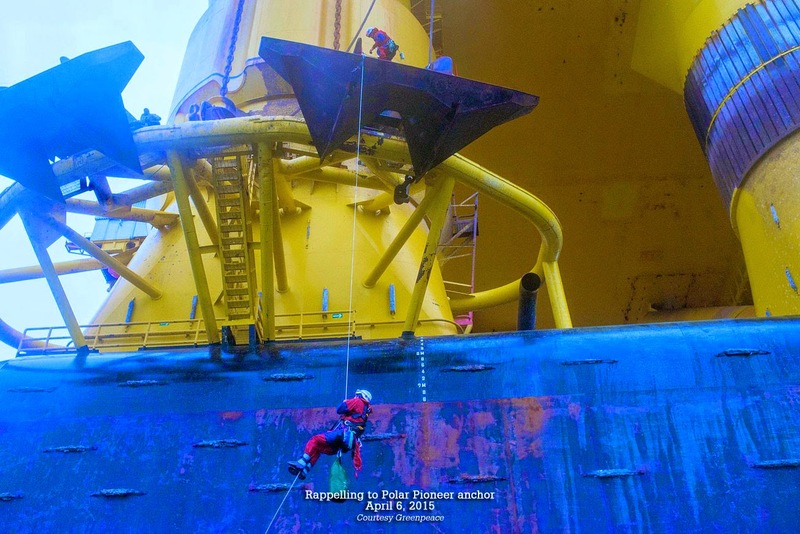 Six crew, heavily armed — with climbing gear — made their way by inflatables to the Blue Marlin, and rappelled aboard the Polar Pioneer, several hundred miles north of Hawaii. 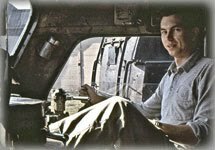 If you are into technical climbing, this article, published on the Rope Gorilla web site explains, with a series of breathtaking photos, "How They Did It." In this clip, Zoe gives us a tour around the encampment. While hard to hear over wind noise, at 3:25 Zoe points out another camp, set up on the deck by crew of Blue Marlin, to keep "an eye on us." She notes the crew of the Blue Marlin has given them "thumbs up." This clip shows how Camp Polar Pioneer was resupplied with essentials, such as toilet paper and radio batteries. 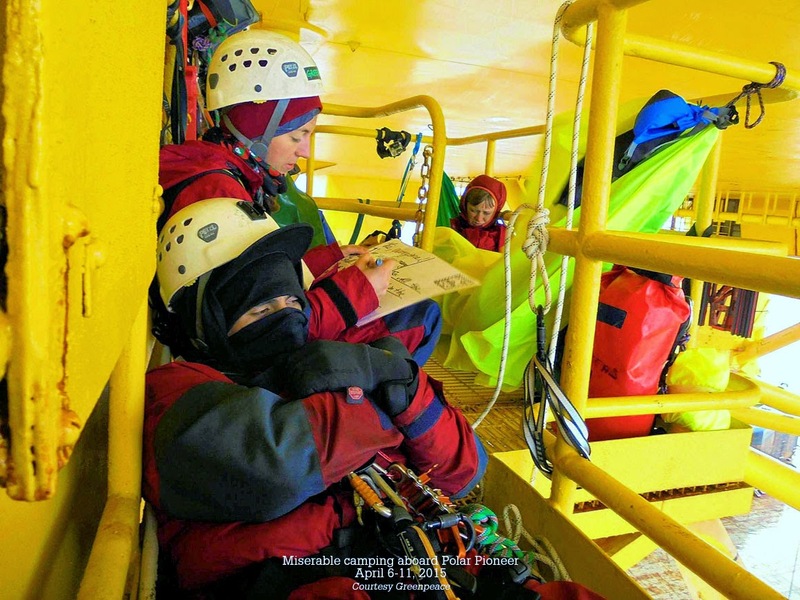 With deteriorating weather conditions, the group left the Polar Pioneer on Saturday April 11th. 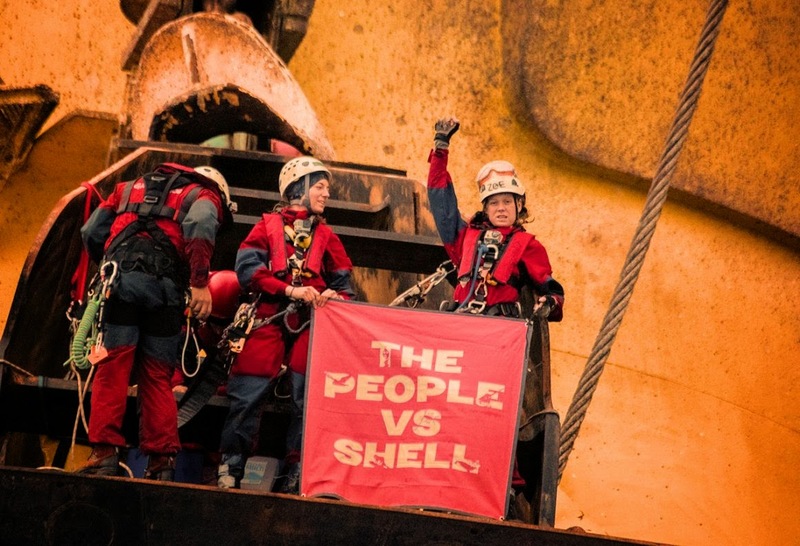 But they accomplished what they set out to, let the world know that Shell was on the move, and that conservationists and activists where determined to impede them at every move. 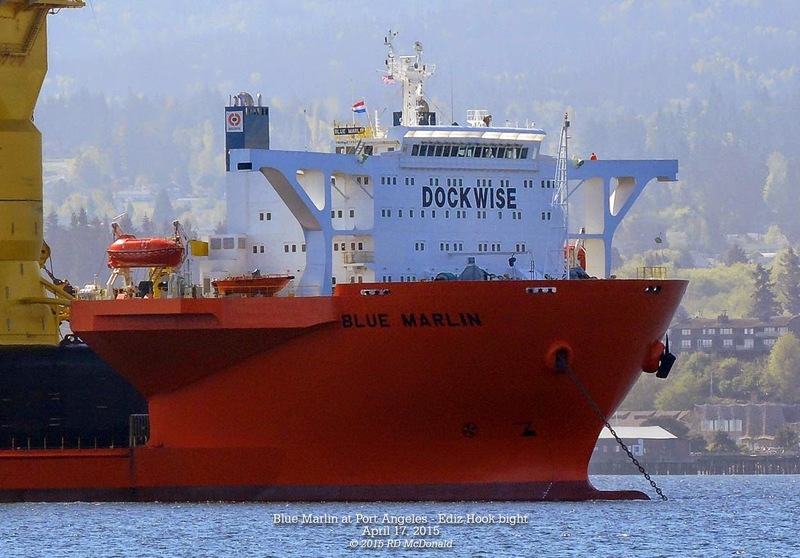 A small group of protestors greeted the Blue Marlin upon her arrival in Port Angeles and staged their protest without incident. 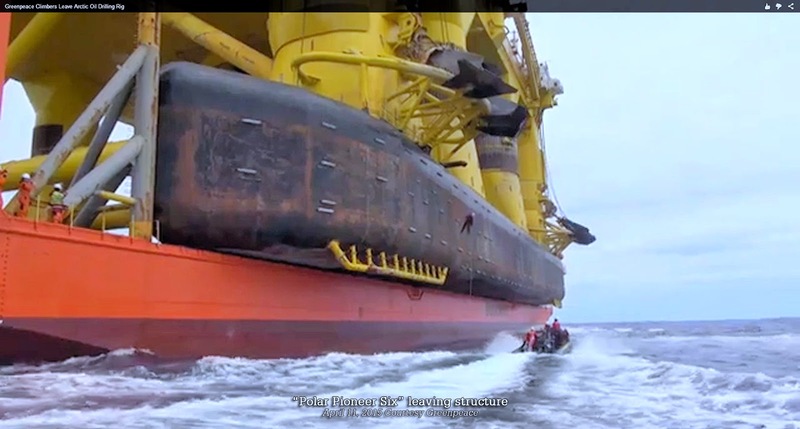 And more protests are scheduled for the anticipated arrival of the Polar Pioneer when she is wet towed to Seattle Terminal 5 in the next week or so. 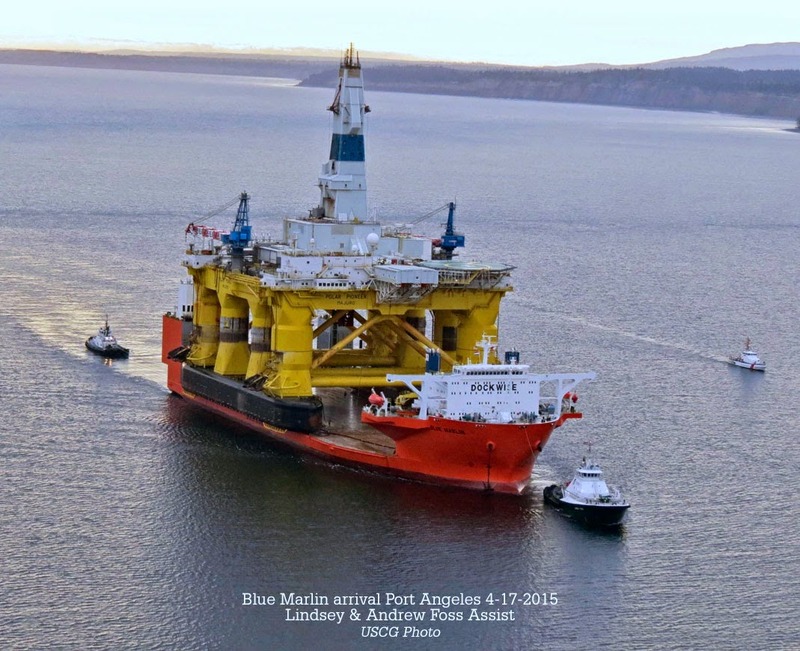 For obvious reasons, Shell isn't exactly publishing a "Schedule of Public Appearances by the Polar Pioneer." 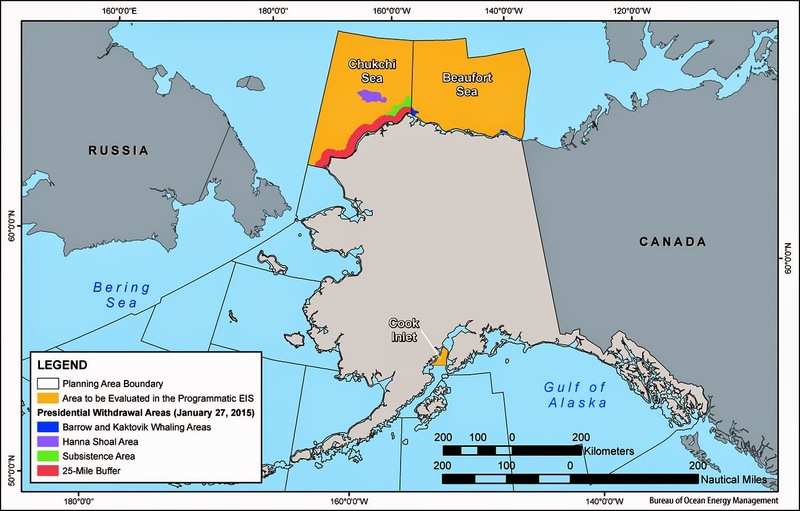 President Obama's Administration recently released a map of the Chukchi and Beaufort Seas, delineating no drilling areas. 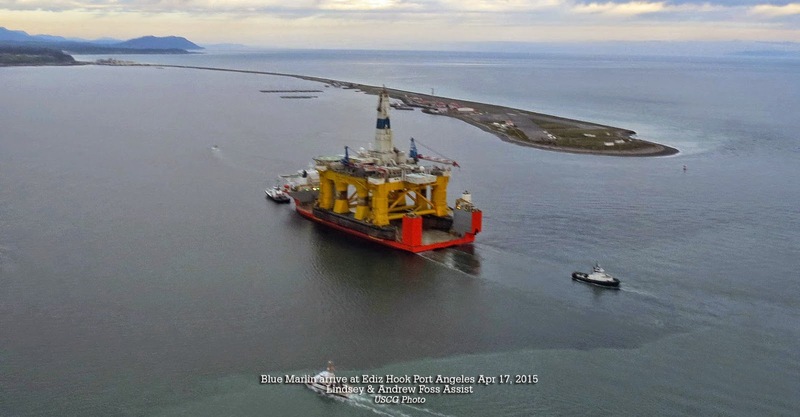 According to a report filed by the Houston Chronicle, "Shell is aiming to drill up to six wells on separate lease blocks encompassing its Burger prospect in the Chukchi Sea, with work unfolding over several years. 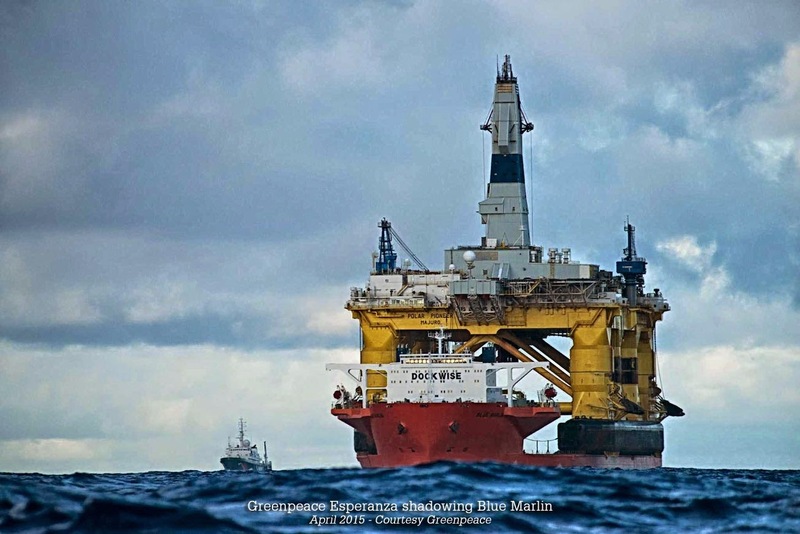 It plans to put two rigs to work at the same time drilling separate wells, allowing it to maximize the short window between the time sea ice retreats and begins encroaching again. 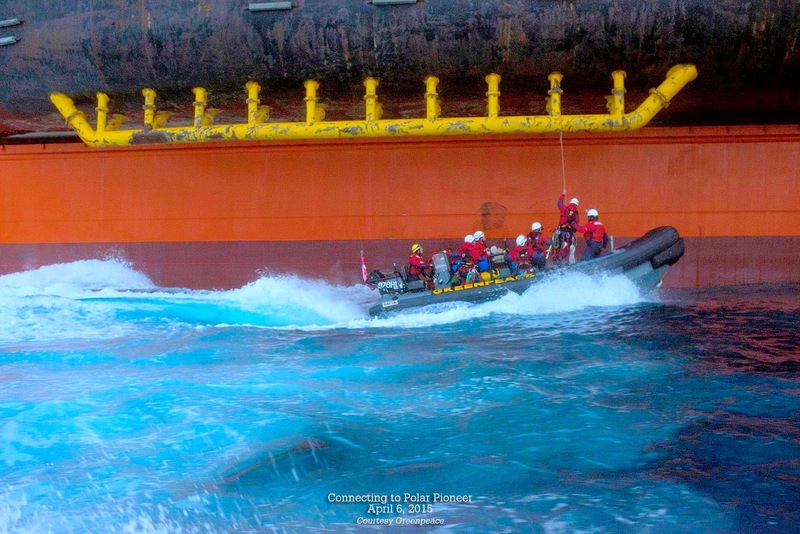 "The tactic also means a second rig will be relatively close by - rather than a seven-day trek away in Dutch Harbor, Alaska - in case it is needed to drill a relief well in an emergency. 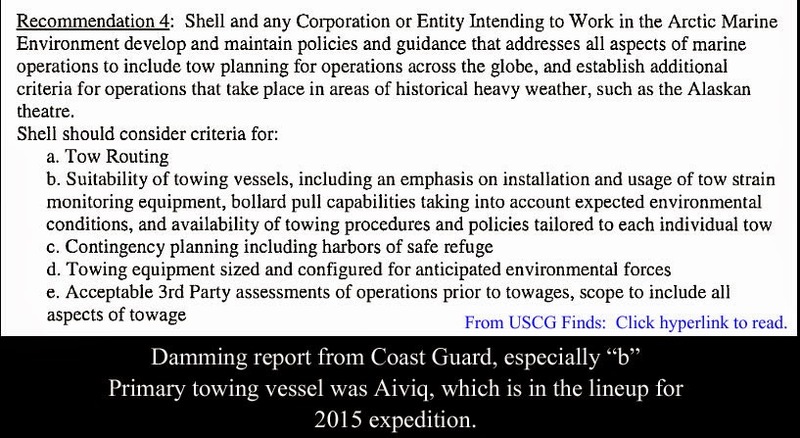 Shell also says in the plan that it is adding support vehicles and oil spill response equipment. These adjustments have been made in direct response to Shell's experiences during the 2012 season. 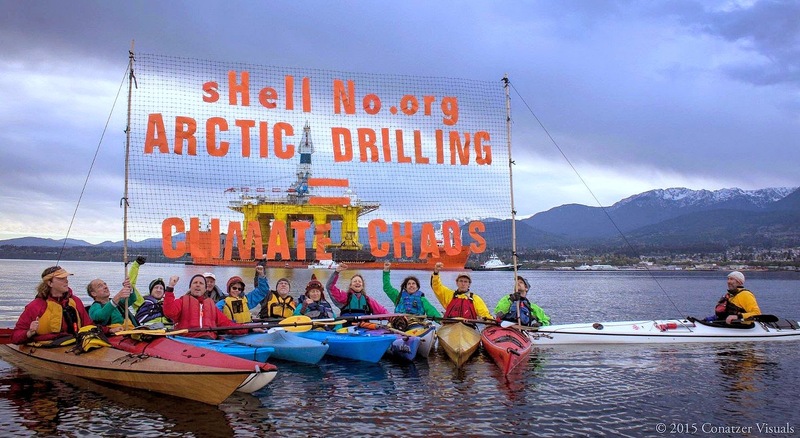 "These assurances made despite the fact that last December, in an eight count felony complaint against Shell's Arctic Drilling Contractor, Nobel Drilling was slapped with a US$12M (€9.7M) fine. The complaint is worth reading. It's only a few pages long. It may give you more than the "once over incorrectly" dished out by Fox and demonstrates a caviler attitude about operating in an area so sensitive to intrusion by man, and explains why not just Greenpeace, but many other environmental groups are planning to play havoc with Shell's second expedition to the Arctic. 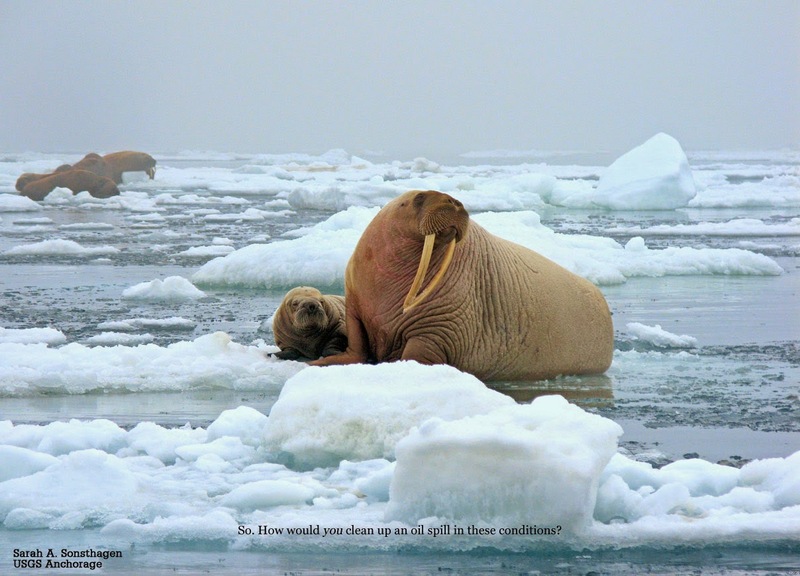 Given that this week marks the fifth anniversary of the Deepwater Horizon explosion, and given Shell's miserable performance in 2012, how do you feel about Shell's incursion into the pristine Arctic Region, already stressed by Climate Change? In the immortal words of J.R. Hughing of "Dallas" fame: When you have licked your conscience, the rest is a piece of cake! 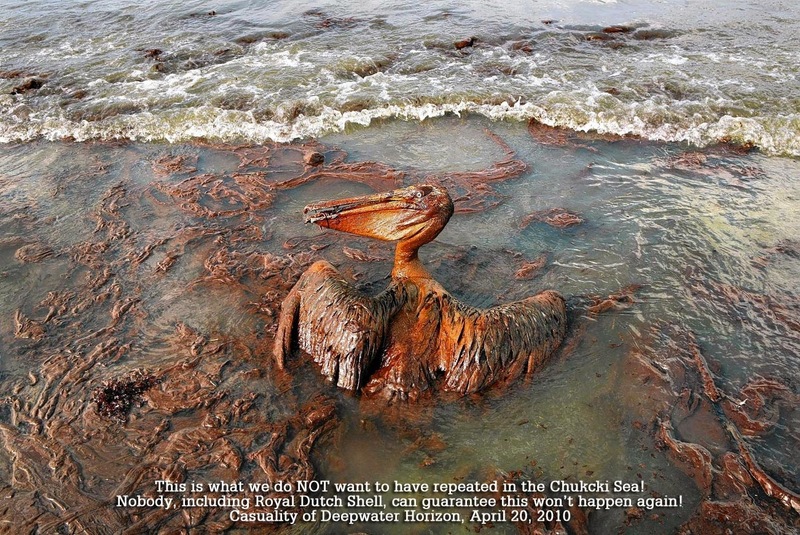 The world through the eyes of oil executives is only dollar signs. Thanks for this underreported news.